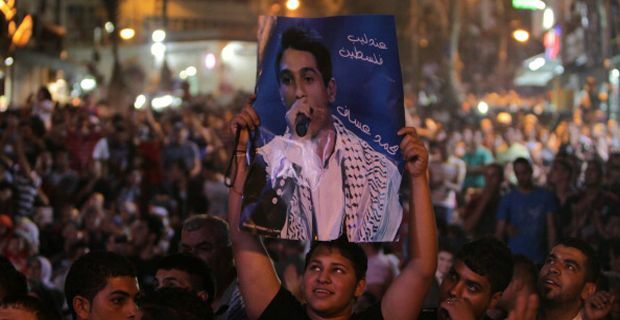 There was an epic outpouring of joy across Palestine last night as Gazan singer Mohammed Assaf won ‘Arab Idol’, which for those of you who haven’t heard of it, is exactly what it sounds like. The television talent show that accepts entrants from across the Arab world was won by the young wedding singer whose roots in a refugee camp made him a symbol for Palestinians everywhere. Moreover, he didn’t merely trot out tired ‘girl meets boy’ cover versions, but made sure that his choices of song always had a conscious, patriotic edge. From old folk songs to rousing odes to national identity, his trajectory through the contest struck a profound chord with the Palestinians. Tens of thousands watched his victory on giant screens in the Gaza Strip and Israeli-occupied West Bank, before letting off fireworks, dancing in the streets and erupting in a wave of celebration. The young singer paid homage to his people, "who have been suffering under occupation for decades”, as President Mahmoud Abbas referred to him as "the pride of the Palestinian and Arab nation". There was huge institutional support for Assaf, with the Bank of Palestine offering to match the price of 350,000 texted votes, while many cafes and independent businesses began offering to text in a vote for every purchase. Ploughing such pride and effort into a singing contest may seem bizarre to jaded Western eyes, but with so little to celebrate, with such economic and cultural strangulation by the occupation, and with so few symbols of national pride, it is difficult to underestimate the significance of this victory, not least because Arab Idol is a showpiece across so many countries. And yet, Assaf came painfully close to not competing at all. He says he had to plead with Hamas to let him leave Gaza, then bribe Egyptian border guards to let him enter the country en route to Lebanon where the show is based. On his arrival, in a touching moment, another young Palestinian gave up his audition slot to Assaf because he felt he would have a better chance of winning. The dour Hamas were unimpressed at first by the fervour the show was creating. No doubt feeling it was unduly frivolous, they publicly criticised the show, describing the name and concept as blasphemous. Other clerics and activists also spoke out against the show, but by the time Assaf had won last night, political figures were hitching themselves to his bandwagon and even senior Hamas figures were starting to come around as the sheer explosion of pride and celebration proved overwhelming. "This young man ... is expressing the feelings of all of us, he is expressing our suffering, our pain, but also our love of life,'' said one teacher while another said "In the middle of the political failures, Assaf achieved something that made Palestinians everywhere feel hope was still possible,".